Raised 20 miles south of Charlotte, I remember going to games with my friends and family and coming home with arms full of Hugo the Hornet gear. Support of the franchise was an elemental part of living in North Carolina, and it still is. I moved into the Queen City to attend UNC Charlotte and immediately took notice to the lingering nostalgia and passion that the city retained for the franchise, even after its decade-long absence. A couple of grassroots movements were campaigning to bring the Hornets back to Charlotte, and they all had my support. It seemed like the attention and drive that the movements had sparked was having an effect. Even those who didn’t have a passion for sports culture could still appreciate the historical value the team brought to the Tar Heel State. The support was so overwhelming that many Charlotteans were certain that Hugo’s teal and purple-adorned homecoming was on the horizon. I scanned the cover and flipped it over to the price tag: one dollar. I walked directly to the cashier, bought it, took it home and spent the rest of the evening skimming through it. The 1988 season was a big one for the Charlotte Hornets, especially when many doubted that Charlotte could even support its own NBA team. Nay-sayers were eventually silenced when the Charlotte Coliseum (which seated 24,000 attendees) was built and the Hornets managed to fill those seats for more than eight consecutive seasons. The Hornets inaugural roster included several veteran players, but I only remember idolizing one player: Muggsy Bogues. At 5′ 3″, Muggsy was the shortest player in NBA history and about as tall as I was for much of my youth. He was unnaturally swift and was never intimidated by opponents who towered over him, the ideal role model who’s incomparable to who kids look up to now. My discovery of the yearbook felt like an omen, because three months later, Michael Jordan officially announced the return of the Charlotte Hornets. 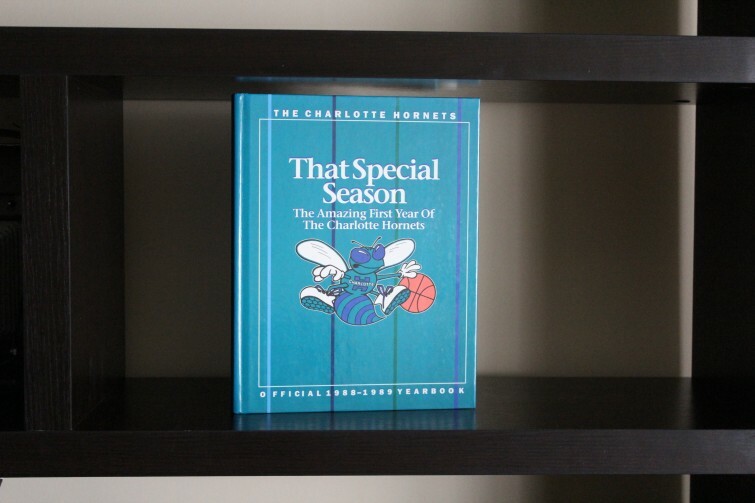 And the first Charlotte Hornets yearbook remains one of my most prized thrift pick-ups to date. What if “Anchorman” was an 8-bit video game?